This is my black repertoire against 1.Nf3 and 1.c4. I recommend 1...c5. There are many transpositions, which is why I combine the two starting moves in this repertoire. For a long time I had difficulties facing 1.Nf3. As a Nimzo-Indian player as Black, I often found myself in uncomfortable positions, when White skillfully exploits move-order tricks. With this repertoire, Black doesn't worry about move orders. With 1...c5 Black rules out certain White variations. Be aware that with 1.Nf3 c5, White can of course play 2.e4 and so you must be prepared to play the Sicilian Defense. But most White players of 1.Nf3, will tend not to be aiming for a Sicilian. We will first cover 1.c4 c5, and everything which does not transition to the Nf3 lines. Then we'll consider 2.Nc3 Nc6. In the second half of the eBook we'll look at 1.Nf3 c5. There are two main approaches, one with g3 and Benoni or King's Indian Attack structures, and the second when White plays c4. You will encounter many similar setups for Black throughout the eBook. For example, we will often play g6, Bg7, e6 and Nge7, which turns out to be a harmonious setup for Black. I believe this is a very good repertoire to get decent positions out of the opening and be able to play for a win as well! So, let's get started! This eBook is a reference companion to the video series, available for €14.99 (or $16.99). If you want to see and hear Niclas provide detailed instruction on this opening, you can purchase the series, which will also give you access to this eBook. Many White players have the starting moves 1.c4 and 1.Nf3 in their repertoire to be flexible and possibly enter preferred variations through move transitions. Grandmaster Niclas Huschenbeth suggests to reply to both moves with 1...c5 and presents a complete Black repertoire in a total of 14 videos. The advantage of the reply 1...c5 lies in the fact that move transitions to d4-systems are not possible anymore. This video series is intended for advanced players. 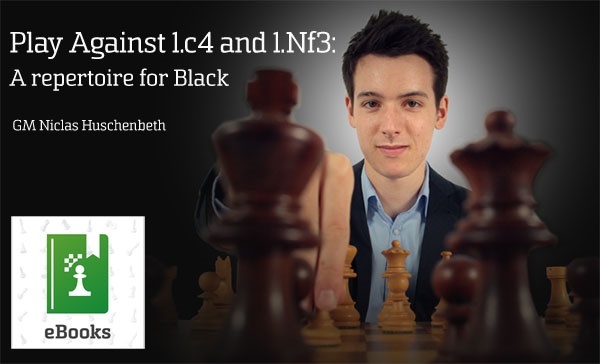 Learn a complete black repertoire against the moves 1.c4 and 1.Nf3, update your theoretical knowledge and play the opening like a grandmaster!